Hortau co-founder Jocelyn Boudreau. 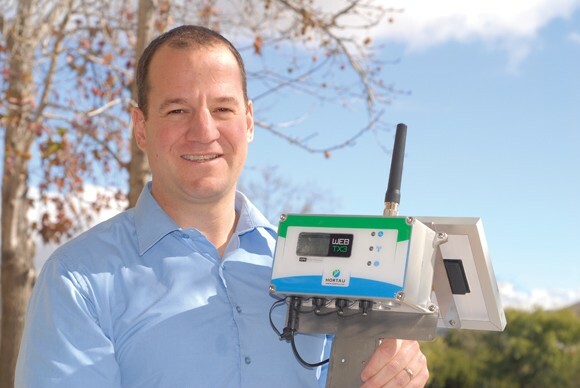 The Canadian company, which maintains its U.S. offices in San Luis Obispo, makes a sensor that measures how much water in the soil is available to crops and then feeds the data to a cloud-based center. The Tri-Counties may or may not see many rain clouds this year, but farmers around the region will be using cloud computing to manage their irrigation with San Luis Obispo-based Hortau. Hortau is a Canadian firm founded in 2002 that expanded into the United States in 2007 with offices in San Luis Obispo. The company makes a proprietary sensor that measures how much water in the soil is available to crops and then feeds the information over cellular networks to a cloud-based data center. Farmers can see how thirsty their plants are in real time, on a smartphone, tablet or computer. They can access maps to tell them which parts of a field need water and set up text or email alerts for frost events or when moisture levels are low enough to stress the crops. While cloud-computing and mobile data technologies have made Hortau’s system easier to use than ever, the core of the system remains the sensor, said co-founder Jocelyn Boudreau, an agricultural engineer. The sensor is custom designed to measure not just the soil’s moisture content, but also a measure known as soil tension. That’s important because soil comes in many types — loamy and rich, sandy and thin or clumpy clay — which has a big effect on whether plants can effectively draw water out of soil without becoming overworked. A 20 percent moisture content in one type of soil can mean a happy plant, while plants in a different soil tension could be stressed. Many plants naturally respond to a water shortage by slowing down their growth, but by the time a farmer notices the slowdown visibly, it’s already too late — yields have suffered. Hortau aims to prevent that. The company has customers throughout the region, from vineyards in Paso Robles to strawberry growers on the Oxnard plain. And one of the biggest benefits growers look for is the ability to get better yields with less water. In an interview, Boudreau held up a parabola-shaped crop yield curve, showing the highest yields when water is just right and low yields when there’s too much or too little. With the right technologies, farmers can drastically cut water use without losing much yield, he said. The company still has to sell systems one farmer at a time — growers are a tough lot and usually want to see a live demo before buying. But demand is strong enough that farmers are now calling Hortau rather than vice versa. And it’s cloud technology that’s enabling the boom. Just a few years ago, the firm was only able to offer systems that beamed data back to a farmer’s desktop computer. The advent of high-bandwidth wireless, economical cloud-hosting and ubiquitous smartphones has changed everything.